Philip Meyer took a series of photographs showing residents of the Blue River Valley as they prepared to move from their homes and farms as part of the Tuttle Creek reservoir and dam relocation project. 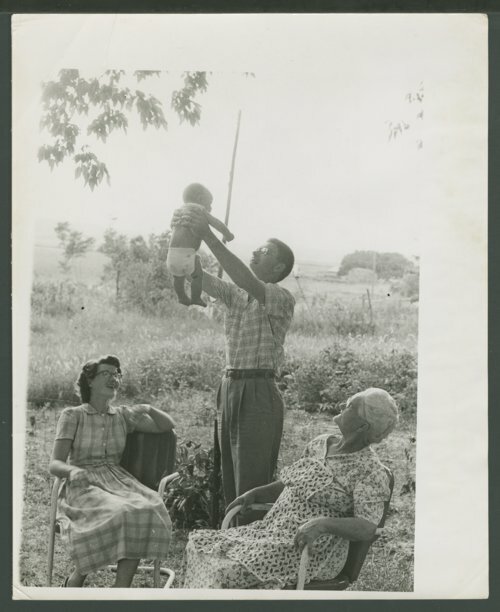 He captioned this photograph "another farewell to the valley was that of Dr. Reuben Burkman, son of a Swedish immigrant who bought a farm in the valley with his earnings as a hired hand. Dr. Burkman stopped for a last visit between the end of the internship and the beginning of a tour of duty with the U. S. Public Health Service. He is shown here with his small son, wife and mother."